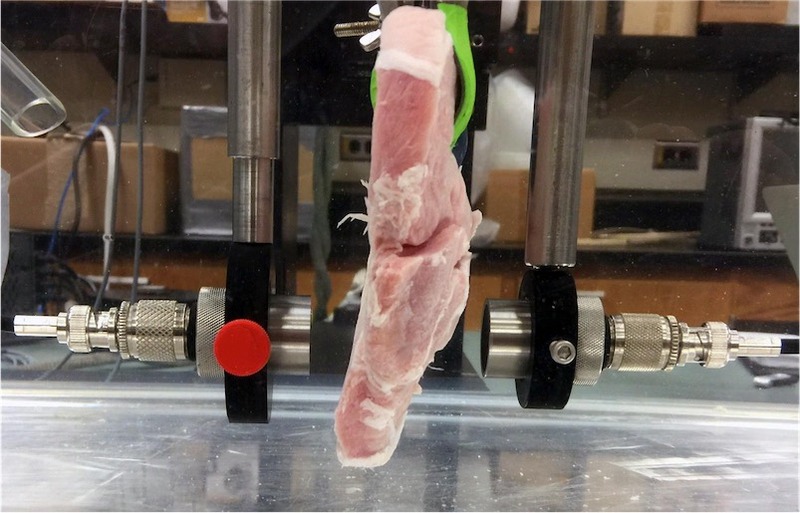 Researchers at the University of Illinois at Urbana-Champaign used ultrasound to transmit high-speed data through pork loin and beef liver. Why? They're developing a system for controlling wireless medical implants and also stream high-definition video from inside the body. "You can imagine a device that is swallowed for the purposes of imaging the digestive tract but with the capability for the HD video to be continuously streamed live to an external screen and the orientation of the device controlled wirelessly and externally by the physician," says engineering professor Andrew Singer. Singer and his colleagues posted their results on arXiv in a paper titled "Mbps Experimental Acoustic Through-Tissue Communications: MEAT-COMMS." That's a whole new spin on dinner and a movie. And you thought 2018 couldn’t get more grimly, disgustingly, apocalyptically fucked up. There are roughly 4,000 “hog-waste lagoons,” that is the official term folks, in North Carolina. In the aftermath of Hurricane Florence, the North Carolina Department of Environmental Quality today says a number of these pork poo ponds are at risk of flooding and overflowing.